If you’re looking for a formidable truck that’ll help you get to work in the Avon, Plainfield or Indianapolis area, the 2018 Toyota Tacoma and Ford F-150 are two great options. So, Andy Mohr Toyota compared these pickups side-by-side to determine which has more to offer Indiana drivers. Start reading our Toyota Tacoma vs Ford F-150 comparison to find out which vehicle is best for you. Handling is one of the most important aspects to look or when deciding on a new truck, and the F-150 and Tacoma have a lot to offer here. In addition to an available part-time 4-wheel drive (4WD) drivetrain, they also each include a drive mode select feature that lets you select the kind of terrain you’re tackling, from at least five different options. The truck then regulates wheelspin and improves traction by adjusting the engine throttle and brakes. 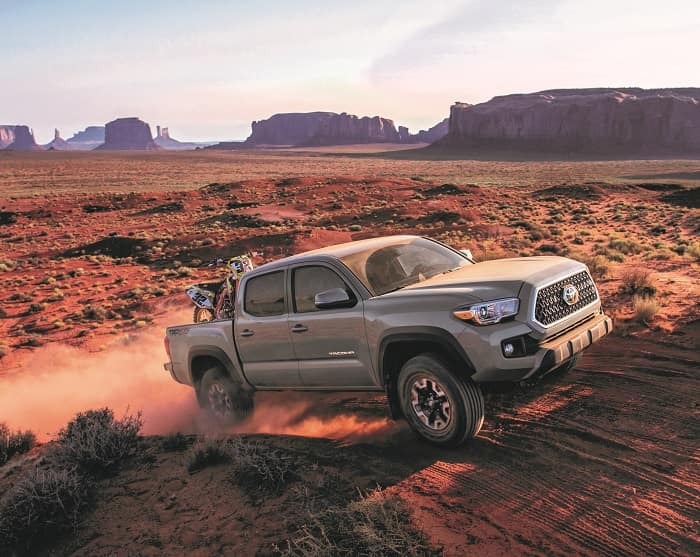 The 2018 Tacoma, however, takes this a step further with the available Crawl Control (Crawl). This system includes five low-speed settings that automatically modulate the throttle and brakes to get you through the roughest terrain, including soft sand. The F-150 doesn’t include this kind of an advanced handling features, so drivers may find themselves getting stuck more often on unforgiving terrain. When you’re not off-roading, each of these pickups include safety technology that helps you prevent a potential impact with another vehicle or pedestrian. Both the Toyota Tacoma and Ford F-150 come with a lane departure system that sends an alert if you veer from your intended lane of travel, and even adjusts your steering to bring you back on course. They also both include an automatic cruise control feature that slows your cruising speed to a safe following distance when approaching a slower-moving vehicle. While the F-150 makes these available only with an upgrade to a higher trim level, the Tacoma makes their Lane Departure Alert and Dynamic Radar Cruise Control systems standard on all trims, including the base. Since the F-150 doesn’t include this kind of technology, drivers may be more vulnerable to unseen hazards on the road. As you hit the open road, there’s nothing better than turning up the volume on some tunes. The Tacoma and F-150 both feature infotainment systems that allow you to do just that, without even taking your hands off the wheel. They both include a fully integrated system that lets you play music, answer phone calls, change the track, and access your phone book, all through voice commands. However, yet again, the F-150 only makes this kind of technology available with a trim upgrade, while the Tacoma offers it as a standard feature in the base trim. 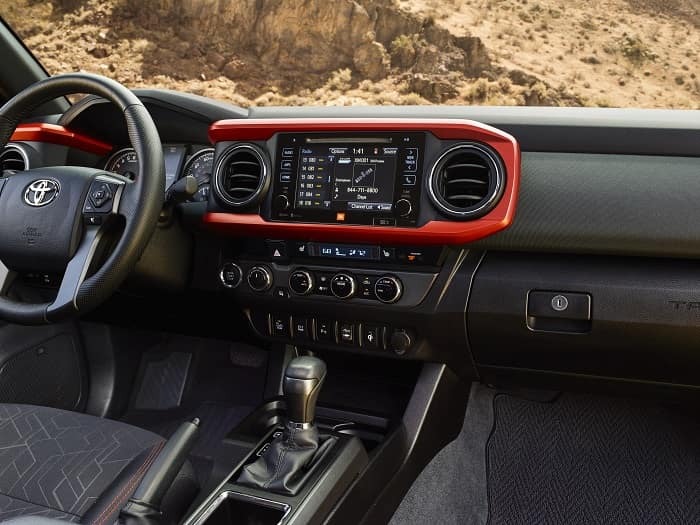 The Toyota Tacoma technology package also includes Siri® Eyes Free which allows iPhone® users to ask Siri® to send texts, access maps, and more through the truck’s sound system. F-150 drivers don’t have access to this technology and may find themselves taking their hands from the wheel or eyes from the road more often to control the infotainment system. After comparing the 2018 Toyota Tacoma vs Ford F-150 on handling, safety technology, and infotainment systems, the Tacoma emerged as our top pick for Indianapolis area drivers. If you want to take this truck for a spin around Plainfield and Avon, contact Andy Mohr Toyota today to schedule your test drive of the 2018 Toyota Tacoma.